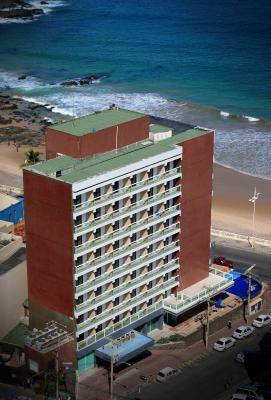 Lock in a great price for Monte Pascoal Praia Hotel Salvador – rated 8.6 by recent guests! We stayed there during Carnaval and it was absolutely perfect for the parade because it passed right in front of the hotel. We enjoyed the concerts of the parade from our balcony and the pool deck. Super comfortable as opposed to being in the crowd of the streets. Highly recommend. Comfortable & clean room, balcony side view of the ocean. Walking distance to restaurants and shops. Free chairs and umbrellas on the beach. We enjoyed the free breakfast spread. We feel we really got our money’s worth during Carnaval. If you are thinking about going for carnival, this is by far the best place to stay. The location of the pool is perfect and oversees the paruades. I traveled alone and this was the best place to stay. I honestly didn’t have to leave the hotel to enjoy carnival. A most stay! I was staying here for a mix of business and pleasure. I was with my wife and adult son in one room. The accommodations were good, not outstanding, but good. The room was clean and it was always cleaned very nicely every day. The breakfast was excellent. There were lots of options for all sorts of tastes, not just some plain continental breakfast with toast and lame eggs. The staff and their effort to make everyone feel comfortable was outstanding. Most people went out of their way to satisfy every guest's wishes. One complaint I have is the lack of ice machines in the hotel for guest use. There were none, and when we asked for some ice, we were charge $R10 for it. That should not have happened, in my opinion. The WiFi was outstanding throughout the hotel. We never had a problem with it! The location of the hotel was very convenient to the beach and a very lively main street. I would stay here again and would recommend it to other people. Very good breakfast. Wide selection of fresh fruits. Nice ocean view. Location of the hotel just in front of the beach (possible to swim) and next to many restaurants. Liked that the hotel offered towels and umbrellas for the beach. Excellent location. Close to the mall, opposite the beach, very nice small breakfast. The most beautiful location overlooking the river and next door to the old town. Cool native decorations, lots of birds to spot, food was great in both breakfast and restaurant for lunch or dinner. Location was great except there is a turn directly outside the hotel, where the broadwalk is, closed to traffic that creates a small traffic jam in the mornings. 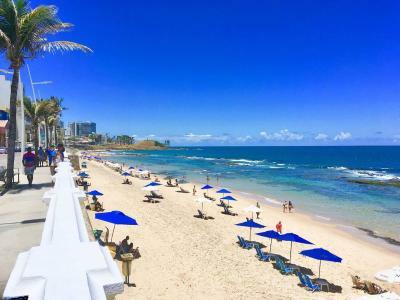 The hotel is located at the end of the broadwalk, in front of the beach, and you can walk to other sections of beach easily. 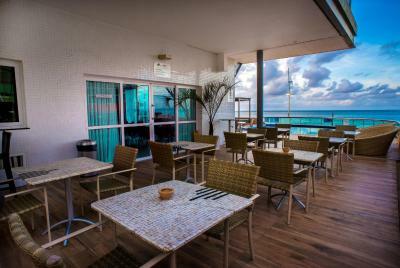 Also close to Shopping Bahia, ( a mall) and other food outlets, within walking distance.. Convenient and safe valet parking services, if you have a car. Breakfast was adequate. The properly is lightly dated, but the rooms were renovated recently, and is more or less up to date for this hotel class. Contrary to previous reports, the front desk does speak English, you just need to speak slowly and clearly to be understood. Pleasant service. Front desk has no problems understanding my American English. 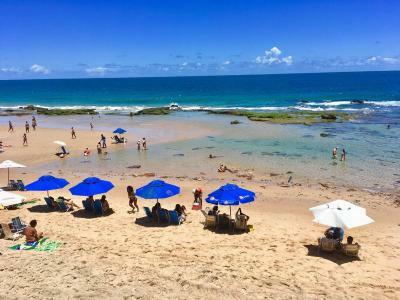 Monte Pascoal Praia Hotel Salvador This rating is a reflection of how the property compares to the industry standard when it comes to price, facilities and services available. It's based on a self-evaluation by the property. Use this rating to help choose your stay! 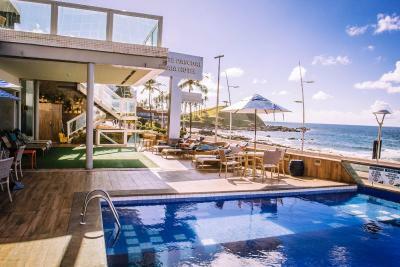 One of our top picks in Salvador.The Monte Pascoal Praia Hotel Salvador is located on the seafront of the famous Farol da Barra Beach, which you can admire from the balcony of your room and from the swimming pool. 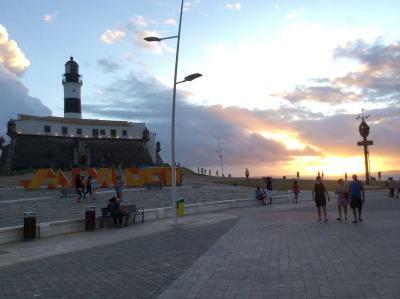 The hotel is only a few blocks from the popular Barra Lighthouse and Barra Shopping Mall. It is also a privileged spot to watch the lively Carnival parade and to reach shops, bars and restaurants on foot. All rooms are equipped with a 32" LED TV with cable channels, air conditioning and a mini-bar. They also boast a balcony and offer a safe and work desk. 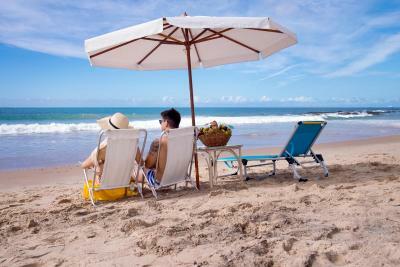 Guests benefit from beach service for free- it includes drinks, meals,use of sunloungers and sun umbrellas. 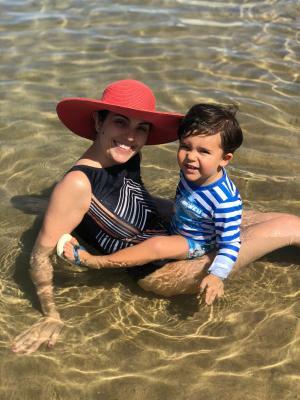 Next to the pool, the Terra Vista Restaurant offers a breakfast buffet with more than 80 different items, including traditional Bahian specialties, such as tapioca, cuz cuz and beiju. At lunch and dinner times, you can choose from a varied menu with regional and international specialties while admiring beautiful sea views. 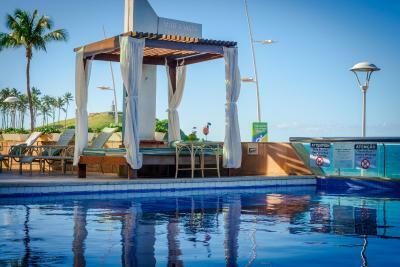 The hotel offers privileged views during the city's New Year's and Carnaval celebrations. 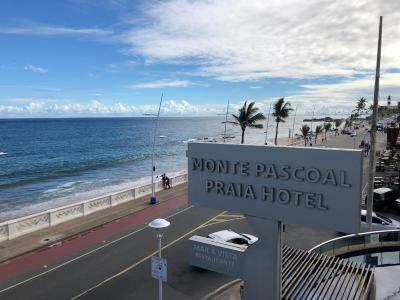 When would you like to stay at Monte Pascoal Praia Hotel Salvador? 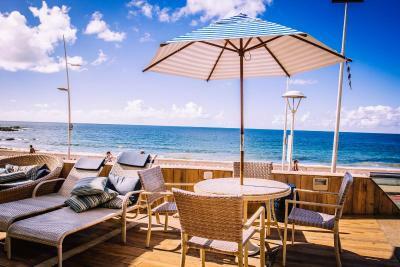 With side sea views from its balcony, this room features a modern air-conditioner with a remote control, 32" LED TV with cable channels, mini-bar, safe and desk. The private bathroom includes a shower. Wi-Fi is free. 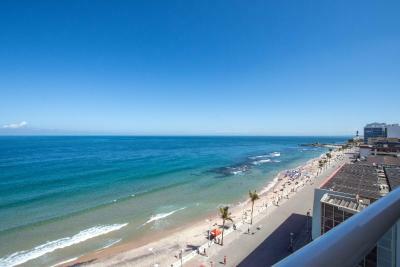 Featuring a balcony with beautiful views of Farol da Barra beach, this room features a modern air-conditioner with a remote control, 32" LED TV with cable channels, mini-bar, safe and desk. The private bathroom includes a shower. Wi-Fi is free. With sea views, this room features a modern air-conditioner with a remote control, 32" LED TV with cable channels, mini-bar, safe and desk. The private bathroom includes a shower. Wi-Fi is free. With side sea views, this room features a modern air-conditioner with a remote control, 32" LED TV with cable channels, mini-bar, safe and desk. The private bathroom includes a shower. Wi-Fi is free. 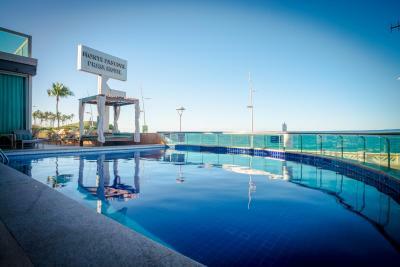 House Rules Monte Pascoal Praia Hotel Salvador takes special requests – add in the next step! Monte Pascoal Praia Hotel Salvador accepts these cards and reserves the right to temporarily hold an amount prior to arrival. Please note that the property can accommodate small size pets, with maximum weight of 10 kg. Please contact the hotel for further details. Please note that the Triple and Quadruple rooms provide 2 double beds only. Single beds are not available for these room types. 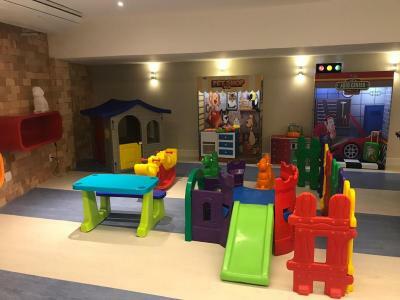 Please note that during Carnaval, from February, 25 to March 11, 2019, the games room, fitness center and sauna will be closed to guests. Staff were great. Lots of good features. Staff were very helpful, service was great, food was ok and hotel is kept very clean. Some evening when we returned to the room the bathroom was giving off a smell of sewer water but it eventually went away. The room is clean and functional, though does not invite to spend much time. There was only one chair to sit on. Limited closet space. The pillows are very hard. No coffee or tea making facilities in the room. During carnival this hotel was right in the middle of it. Great on the one hand to also see from the balcony when you are not outside. Of course, it is extremely loud if you have a light sleep. Safety was top notch as only hotel guests were permitted to enter. Note it is inside the security zone of carnival. Breakfast was in Bahia time, so did not close exactly at 10 am. Staff were friendly and helpful, even if only a very few spoke English. Good air conditioning in the room. You have a front row view to the carnival procession from the pool area. Functional safe in the room. Because I traveled alone the staff was very strict about who I could have in my hotel. I didn’t like that very much because I wanted to meet knew people. I still was able to, it was just a little hassle. I did not like the lack of availability of free cold water and ice. Maybe it's just a habit in the USA, but I like cold water with ice at every meal. The air-condition motor is located on the balcony and hot air is coming out making unpleasant to seat. Great location. Great service. Nice warm pool. Free use of umbrellas and chairs on the beach in front. With full service for drinks, food etc. ( @ extra cost). Clean rooms. 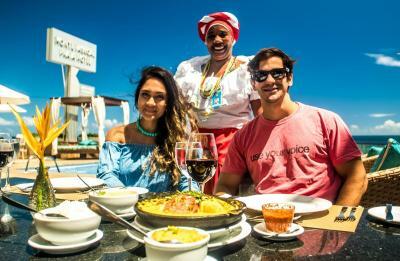 Good breakfast with local Bahia food options to try. Hotel would not allow access to other floors for security purposes. I was traveling with other people and we were unable to visit each others rooms on different floors.